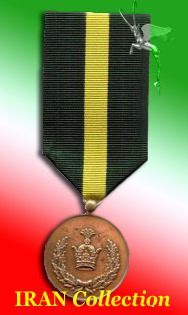 This medal was founded in late 1920s in three different classes by Shah Reza Pahlavi. The first class medal is made of gold, second class of silver and the third class is a bronze one, all with the same appearance. On both sides, is the relief of the Pahlavi crown, garlanded by a wreath.